The mainstream media has been gleefully reporting for years that the conservative movement is without a leader and more recently that the Tea Party is dead. You and I both know this is not reporting, so much as it is wishful thinking by liberals. Next month, Citizens United along with Americans for Prosperity Foundation, will once again prove the liberal media wrong when we host an important event in Manchester, New Hampshire that will feature some of the many members of the promising future of the conservative movement. 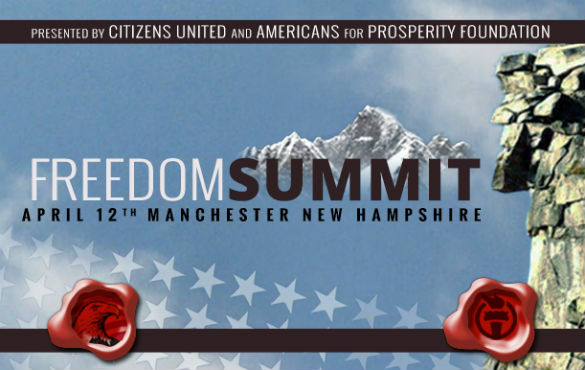 Just three days before Tax Day, conservative grassroots activists will gather with us in New Hampshire for the inaugural Freedom Summit. Our event will focus on how we can get America back on a course that adheres to the bedrock principles that have made our country a beacon of freedom for the world. It’s crucial that we refocus on the principles that this nation was founded upon, and I can think of no better time to start refocusing than around Tax Day. A time when so many Americans who are not politically engaged are shocked by the realities of over taxation and Big Government, it’s during tax season we can highlight differences in philosophy and connect with our fellow Americans to offer alternate solutions to the failed liberal agenda. The Internal Revenue Service is the perfect example of an out of control federal government bureaucracy run amok. The ongoing conservative targeting scandal is a grave reminder that with 90,000 employees (roughly the population of Albany, New York), the politicized IRS has too much power over too many areas of our lives. Today inside its walls, IRS agents control your taxes, your health care, and your right to participate in our political process. We are a nation founded on the rights of the individual, not the expanding power and influence of a centralized government, and we are proud to host this event with leaders who will focus on our individual liberties and the vision of the Founding Fathers. The conservative leaders who will be speaking at the Freedom Summit include: Senator Rand Paul, Senator Ted Cruz, Senator Mike Lee, Governor Mike Huckabee, Senator Kelly Ayotte, Representative Marsha Blackburn, Representative Steve King, Speaker Newt Gingrich, radio talk show host Laura Ingraham, AEI President Arthur Brooks and Mr. Donald Trump. It is an honor to host so many prominent voices and to facilitate an event that allows these leaders to take their important message directly to the grassroots. If we are to succeed in changing the direction of our nation, we must empower those at the local and community level to take action. I look forward to hosting this event with Americans for Prosperity Foundation and encourage you to learn more about it HERE. It’s an exciting time once again in our conservative movement, and it’s my honor to stand alongside you, the grassroots activists who are on the front lines of the everyday battle for freedom in this nation. Even if you don’t live in the New Hampshire area, you can be a part of this event by watching it via livestream on the Summit’s website. Thank you for all you do to advance the cause of liberty in your lives on a daily basis, together we can show the mainstream media just how wrong they are. Submitted by sir_aslan on Tue, 03/25/2014 - 14:05. I wish I could say that I was excited and sure its nice to have a big tent. However, when one looks at the influence the establishment has on some of the candidates its about time someone raised concerns. Mike Huckabee is too cozy with the CFR for comfort. Newt Gingrich is himself a member of the CFR and presented legislation to the Congress that has enabled the establishment to carry out their Global agenda and Ted Cruz wife worked with CFR/David Pastor to put together the blue print for Nafta. Should I go on? Well, Cruz should know: The candidate's wife, Heidi S. Cruz, was an active member of the Council on Foreign Relations until this June. She was a member until June on a 5-year "term membership" program, an official at the organization confirmed. Submitted by Karen Wainio on Tue, 03/25/2014 - 12:55.
lackey who loudly supported the disastrous CIR/amnesty senate bill? And isn't she the McRaine/Grahamnesty cheerleader who supports the saber rattling senators from AZ and SC in every military adventure these guys want to take the country into: Syria, Crimea, Iraq, Libya, Ukraine? Yes. She's the one. She's no conservative. She should be speaking at a NEOCON convention chaired by Hilary Clinton, Bob Menendez, Bob Corker and John McCraine.